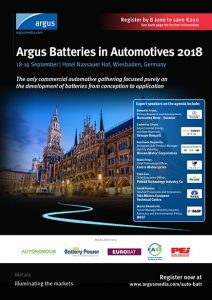 DHD have produced the Argus Batteries in Automotives 2018 delegate brochure. The event takes place on the 18-19 September 2018 at Hotel Nassauer Hof, Wiesbaden, Germany. This is the only commercial automotive gathering focused purely on the development of batteries from conception to application. The European Commission’s aim to reduce fuel emissions by 20pc by 2020 — with a view to ending the manufacture of carbon-emitting cars completely — may be the biggest issue for your e-mobility strategy. Electric vehicles are key to this, but some in the industry are questioning whether adoption of electric vehicles by a majority of road users is achievable by the commission’s deadline. This has led many to ask what alternatives there are, and how the gap between internal combustion engines and mass adoption of electric cars can be bridged. Join the debate and delve deeper into automotive battery development — from conception to application — at the Argus Batteries in Automotives conference. The event will cover research and development, infrastructure and automotive industry trends. Join cell and cell component manufacturers, battery and battery pack manufacturers, original equipment manufacturers and service and solution providers to map the future of batteries in e-mobility.